Thanks so much for having me here on Falling for YA! 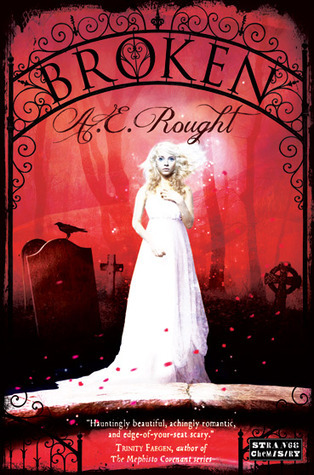 I’ve been on blogs talking about retellings often since news of Broken’s sale went public. Everything from why I chose a write one, to how I wrote it, to what I put it and what I took out. As with every modern spin on a classic, there are questions to answer: the standard who/what/when/where/why and then, how close is too close? Where’s the line? Is there such a thing as too different? Do I dare tread where my toes might get bitten off? With retellings, there are inherent boons and challenges. It’s still ice cream, but YOUR ice cream. I’ll admit, when working up Broken, I was all about the boons and building the retelling sundae my way. It was originally intended for just me and my readers, so I wandered the cases of Frankenstein elements, picking this thread because it went so well with the flavor we loved, and accenting with this texture and that color. The challenges, for me, were what to use and why. Mary Shelley’s Frankenstein is such a rich, layered work, and told Victor Frankenstein’s story so brilliantly. I knew I didn’t want to tread that close, especially with other authors adding their spins to his tale. Settling on Frankenstein’s monster was one challenge met. Then, my plot buddy and I opted for the more sympathetic, hero-like version of the monster in the movie VanHelsing—pretty kitsch in comparison to the original, I know, but I’m a sucker for a tortured good guy with dark qualities. I used the mad scientist creating life and the repercussions as a major plot thread, which produced the challenge of how to tell it using the monster as a focal point. Creating Emma, the girl that falls for my version of the monster and telling it from her point of view, solved that. It also gave me a great avenue to further explore the far-reaching effects of what a modern day Frankenstein monster scenario could have. Mostly, I wanted to break hearts, and Emma and Alex gave me a lot to work with! So, I think challenges and choices go hand-n-hand, and every retelling—every story—is its own choice. There are some questions I think affect any modern spin: how close? how far? vanilla or chocolate? I think I’ll take my retellings swirled, because I enjoy the challenges of twisting what was into something new. This book was not on my radar before but now it is on my TBR list Thanks! !